Flying is routinely quoted as being the safest mode of transportation on the planet, and that is due to a solid factual basis which supports the claim. Flying is the safest way to travel. However, when an incident or accident occurs, particularly one which leads to loss of life, it is much higher profile than most other modes of travel, particularly the most dangerous mode of transportation which are private automobiles. Most aviation accidents (70%-80%) are not even the result of vehicle malfunction, but of human error. If the problem is not the equipment but is instead the people, what can be done to reduce the risk? Training is the key safety tool for maintaining vigilance in the process of aircraft maintenance. But is it as simple as just a blanket statement that ‘training’ is the fix for human error? No. Fortunately there has been extensive research into the human factor in aviation and just exactly how training reduces risks associated with human factors and human error. What human factors exist in aviation maintenance? The entire process of aviation and aircraft maintenance is inspired by human factors. From the moment an aircraft enters the manufacturing facility, or a tug is attached to the landing gear, human factors exist. But what exactly are human factors in this case? There a whole of them, so let’s have a look what are widely known as the “Dirty Dozen” in the industry. Perhaps the simplest concept, yet it leads to the most accidents. 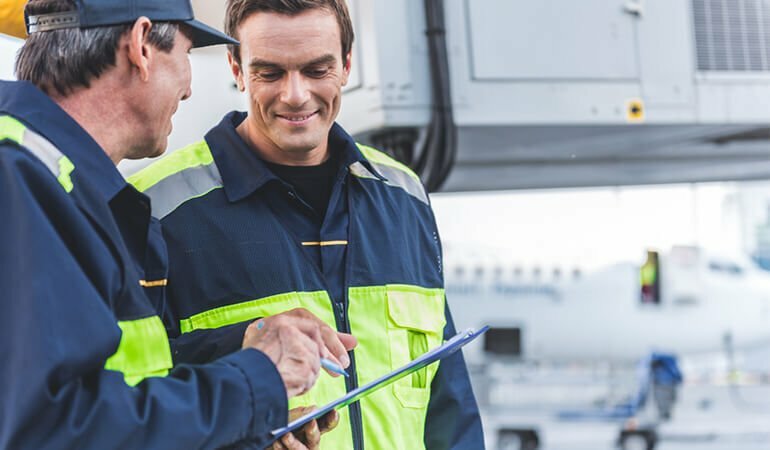 Miscommunication is the leading culprit in aviation maintenance accident reports, and it is not difficult to understand why. Airports are very noisy environments with a fast pace of work which leads to only about 30% of verbal communication being received and understood. Less than a third. This is the dangerous situation where routine activities, regardless of the actual risk, are viewed as routine and have become commonplace. A great example is the constant running of auxiliary power units (APUs) on some aircraft for ground functions. When it becomes utterly commonplace, operators often are lulled into complacency and forget the real dangers posed during the operation of a jet engine (extremely hot exhaust, spinning turbine blades, turbine danger areas, etc.) regardless of size. Just because a technician is certified and a licensed mechanic does not guarantee their knowledge base. Sometimes technicians are pressed into conducting tasks outside of their scope of experience and knowledge because of pressure from supervision, and sometimes people just overstate their actual abilities. Regardless of how they get to this problem, it can have really grave results. Just like finding yourself distracted while driving, it happens at work. It also happens for and by the same things: looking at your phone, thinking about personal life, financial woes, or just taking a mental break – just typical human factors. There are many problems with this, though. When returning from distractions, people often pick up in a different place than they left off, usually ahead. Also, entertaining distractions while working can be very dangerous. Being distracted while operating engines can lead to a hung or hot start, or failing to bring down the throttle when personnel or vehicles are in the area. Lack of teamwork stems from personality conflicts, incompetence, or non-contributors. Strong and overbearing personalities often intimidate more timid and mild people, causing an imbalance in skills. Teams begin to circumvent altogether, incompetent employees as well as non-contributing employees. Leaders must identify these problems and appropriately place personnel in their teams. Fatigue is a common point of failure in all industrial jobs. Exposure to the weather and elements wears down employees, particularly environmental extremes. Also, lack of good sleep, prolonged periods of working extended shifts, and jet lag can all play into fatigue. The problem with fatigue is that us people tend to underestimate how fatigued we really are and judge incorrectly our ability to cope with fatigue. Time is money, as they say, and there is often a push to complete tasks even when quality components are not available. Techs are often pushed to complete tasks regardless of what means are required, often with supervision turning a blind eye with the caveat of “we never told them to use old parts”. It is always implied. Physical parts are not the only resource in play. Other resources include time, experience, knowledge, or qualified support. Nobody accuses aircraft maintenance of being low pressure because it isn’t. It is fast paced, technically intense, physically arduous, and carries huge personal liability. This one cannot be overstated even though it seems a little, well, “feely”. The strongest personality in the room does not equate to being correct more than anyone else (often, a whole lot less). Lack of assertiveness from team members creates a lot of blind spots in the organization. The conditions are now ripe for groupthink which stifles creative ideas, and sometimes smothers observations of clearly unsafe practices. Aircraft maintenance is a high-stress venture, probably a good reason for the rate of turnover in the career field. The variety of stress found in this is not the good kind (acute), but is instead chronic. Chronic stress is the kind that wears on you, year after year. Family demands, financial hardship, and even career discontent grind away at a person’s psyche and lead to errors in judgement, health problems, moody personalities, lack of concentration, and so on. This is very important for all people because chronic stress truly is the silent killer. It promotes weight gain, fatigue, poor sleep, and ultimately early death if left unchecked. Take this one very seriously. While airports give all appearance of being bustling with activity, this isn’t always the case at an MRO. Sometimes even at large hubs, technicians can find themselves isolated in faraway parts of the facility. Of course this literal isolation is the physical manifestation of the mental isolation many people are in on any given time. Lack of awareness also is propagated by stress, fatigue, distraction, and pressure, all of which take the focus away from the mission and focus solely on the individual. “We’ve just always done it that way.” The most common response when people are questioned on why they never adopted a more efficient or effective way of doing things. If the norms are promoting a culture of safety, excellent! However, norms often are more a representative of actions which have slowly been accepted over time which should have been nixed long ago. Now that the “Dirty Dozen” have been identified and explained, what exactly would training do about it? In the world of aircraft maintenance, training is generally considered to be vocational and technical in nature. But in the case of human factors, training is more interdisciplinary in nature including a fair degree of psychology. Training is the catalyst which allows technicians and their leadership to identify the human factors present in themselves and their respective employees. Once the human factors have been identified, training in human factors provides the tools to correct the problem. People are the most valuable asset in all maintenance activities and will not be replaced any time in our lifetime. AI has come a long way in a lot of areas but the ability to use logic to understand and troubleshoot systems, then move on to replace and operationally check the component. The human mind coupled with the human body is irreplaceable by technology, but more importantly is the inability of machines to have instincts, intuition, and a sixth sense, gut feelings, nuance. With all of these intangibles come the human factors listed above. Can equipment help the human factors? To some extent, proper equipment does help reduce the effects of human factors. For instance, employing the use of modern equipment such as automatic guided vehicles (AGVs) can help reduce distractions by reducing the number of personnel on a given task, thus allowing the operator to focus completely on the task at hand. On a positive note, the study of human factors in aviation maintenance has been studied for several decades now so there is training readily available. Most of the courses are less than a week in length and are provided by industry leaders. These courses are designed with the intention of training the trainer to take the knowledge back to their organization to share. The UK Civil Aviation Authority offers a course specifically on Human Factors in Aviation Maintenance. Human factors impact everything in aircraft maintenance; there is no aspect of the work which is not affected in some way by human behavior. Maintaining mechanical machines is a distinctly human thing to do, so the conditions in which the human technician finds themselves in play very relevant to the task of safely working on aircraft, regardless of size and scope. Training to identify and correct human factors is an excellent investment for leaders and technicians alike, as it allows them to identify risky behavior and create actionable plans to correct said behavior. Equipment does help alleviate some human factors (certainly not all), particularly the use of equipment which directly reduce the burden on technicians thus reducing stress and pressure. You will never fully eradicate human factors; they are far too deeply ingrained in our biology. Rather, you can put measures in place to identify them, modify behavior, and mitigate damage, and training is central measure of these efforts. You liked this blogpost? Find even more helpful input for improving your ground handling in our free eBook!